Right from the very beginning, Optimist Prime was well aware of the challenges he faced in this debate. He knew there are always long odds associated with pleading a case for any figure as the greatest in their respective field, let alone the greatest across all sports. Yet, he still made his case for Jerry Sloan as the greatest coach to never win a championship. Ever the hopeless optimist, he made a valiant effort to support Sloan’s claim to the legacy of being the best coach without a ring. He cited a compelling case for the very best Utah Jazz teams that Sloan coached to Western Conference championships following the 1996-1997 and 1997-1998 regular seasons. He explained that these excellent Jazz teams were among the very best in basketball and only failed to win a championship because they faced the Jordan Era Chicago Bulls, perhaps the greatest team in NBA history. At first appearance it seems that Optimist Prime basically made a case for Sloan on the premise that playing second fiddle to the greatest of all time should count for something. But I think his argument means slightly more than that. It means that had Sloan’s Jazz teams of the late ‘90s played in a different time, there may very well have been no debate at all as they would have in all likelihood come away with at least one championship. While I was not quite ready to jump on the Sloan bandwagon just yet, I kept finding myself returning to one statistic that Optimist Prime pointed out in his argument – that Sloan is one of three coaches to have at least 15 consecutive winning seasons. The only other two coaches to accomplish that feat are Phil Jackson and Pat Riley, and those fellas know a thing or two about great coaching, as evidenced by their championship hardware. That is some pretty elite company to keep and comparatively that accomplishment helps Sloan’s success transcend the NBA. After reading Optimist Prime’s words a second time through, I began to think that maybe – just maybe – Sloan could indeed be the greatest coach without a championship… that is until I read Bleacher Fan’s argument. I don’t normally like to gush about one of Bleacher Fan’s arguments, as his ego is already Shaq-sized. But his argument was honestly an unstoppable freight train of correctness. His case against Sloan didn’t just poke holes in Optimist Prime’s argument – it made Swiss cheese of it. It is not that Optimist Prime did anything wrong, either. He played the hand he was dealt in this debate as well as anyone could, but Bleacher Fan brought the pain with one relentless point rebuttal after another, ultimately earning him today’s win. His assertion that there is something inherently wrong about walking away from a team mid-season is dead on. It speaks more of Sloan’s cowardice and defeated attitude than it does of adding to the legacy of being one of the best ever. His point that coaches in other sports have better career regular season winning percentages than Sloan (to say nothing of bettering his pedestrian .485 winning percentage in the playoffs) was certainly not lost on me. He put the nail in the coffin when he proved that Sloan wasn’t even the greatest coach in his own league without a title. By point out the fact that Don Nelson has far more NBA coaching wins in the NBA than Sloan, proving beyond a shadow of doubt that Sloan really doesn’t even belong in the “greatest ever” conversation. Here’s to you Bleacher Fan. 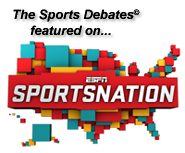 You are the victor for writing one of the most compelling arguments I have ever judged here on The Sports Debates. This entry was posted on Friday, February 25th, 2011 at 10:00 pm and is filed under The Best Coach Without A Title Debate. You can follow any responses to this entry through the RSS 2.0 feed. You can leave a response, or trackback from your own site.